The HP Slate 7 might seem like just another 7-inch Android tablet, but it means so much more than that. Mostly, because of that logo on its back - it is HP’s first Android tablet and Microsoft better pay attention as its former biggest vendor is now using Google’s platform for tablets. The HP Slate 7 of course is not a technological masterpiece - you wouldn’t expect this from a device that costs $169 (169 euro). Unlike its Android peers in that price segment though, the Slate 7 feels surprisingly well built. A soft touch back and a light profile make it a pleasure to hold and you’d never think by the feel of it that it is that cheap. On the sides, there is a stainless steel finish. Good job, HP. But look outside the design department, and you start to see all the compromises HP made to achieve that low price. The 7-inch screen is of the poor 1,024 x 600-pixel resolution and it didn’t quite impress with vibrant colors. There are a lot of good things going on here, though. The near stock Android 4.1.1 flows smoothly. The 1.6GHz dual-core Cortex A9 processor felt snappy enough for basic gaming. 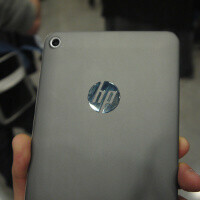 Overall, the HP Slate 7 definitely has the potential to give the Nexus 7 a run for its money. Take a look at it below.